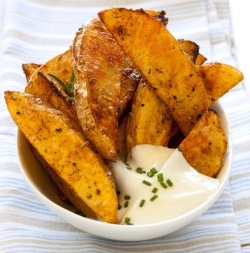 These fabulous potato wedges get a spicy kick from garlic salt, pepper and some chili flakes. They are easy to make and really pack a punch in terms of flavor. Preheat the oven to 400ºF (or 200ºC). In a large bowl, mix together the potato wedges and a small amount of oil. Add the garlic salt, black pepper, cayenne pepper, parsley, salt and red chili flakes, mixing to coat evenly. Place on a cookie sheet and bake in the preheated oven for about 20 minutes. If you want a crisper skin on the potatoes, broil them for a few minutes at the end of the cooking time. To make the dipping sauce combine sour cream, dressing and cheese together in a small bowl. 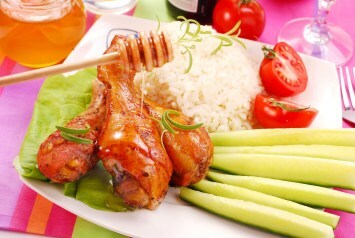 If you really like it hot, add a few drops (or several) of hot sauce. Serve the potato wedges with the dip on the side. You can use vegetable oil instead of olive oil. I use olive oil because it is so healthy for us and adds a nice taste. Use whatever oil you prefer that tolerates cooking at a high heat. Vary it up a bit. You can also use onion salt, cayenne pepper, or even a bit of dried oregano if you want. Browse all of our potato recipes here. Try these spicy potato wedges with our salsa hamburgers.